Before you can use mushroom compost you must first understand what it actually is. 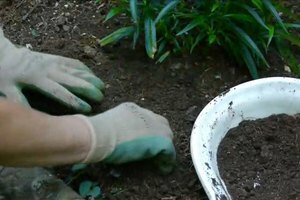 Use mushroom compost with help from a landscape designer and horticulture writer in this free video clip. Hi, I'm Marci Degman, The Aspiring Gardener, and today we're going to talk about using mushroom compost. Now you'll hear a lot about how wonderful it is and then you'll hear people say, it's nothing special, it's like every other compost. So what we're going to talk a little bit about is what is actually in mushroom compost. Now what it is is it's a byproduct of the commercial mushroom industry and what they do is they mix all these things together that are perfect for mushroom growth and then after a few weeks of harvesting mushrooms, they discard it because it doesn't have enough of the things mushrooms need but it still has a lot of nutrition for plants and usually there are three components but they vary. There's always some type of manure and then there's some type of straw or soybean meal or some kind of a byproduct, probably depending on where you get it and what is typical in that area and then there's something to sweeten the pH like lime or gypsum. So these are things that we normally like to put into our soil anyway but the one component that is different is that there's fibers from the growing of the actual mushrooms, the little haifa that go down into the soil and that grow underneath the ground, actually create moisture retentive properties in the mushroom compost. So that is one of the greatest parts of it. So for people like me that do use it, what mushroom compost is is sort of like the one thing I have to apply. It can be my compost, my mulch, all in one and nutrition for my plants. So you can do the same thing with other composts or mixing your own but if you use mushroom compost it's a sort of all in one package. Now it's got a really nice texture. It's fluffy and again it holds a lot of moisture so it's really nice to use and it's really dark brown so it actually looks nice on the soil so you don't really have to cover it with bark and other things that you might put over it. There are some drawbacks to using mushroom compost. Now one thing that it does is it has a lot of soluble salt. Now that's good for certain plants but it's not the best for your rhododendrons, azaleas, blueberries and the other thing that are mentioned are germinating seeds and small seedlings. It's just too strong. Now I have used it on my rhododendrons and blueberries without any problems so it may just depend on what is in the mushroom compost, how long it's been aged and how much you use. So that's something you just need to be aware of and be cautious. Now what some people do is take the mushroom compost, mix other things with it to dilute that down so they can still use it without the worry of the salts. Other than that, you use it like any kind of compost or mulch. You just put a top dressing on the soil or you can take it, incorporate it into the root area of perennials and vegetables and things when you're planting. If you're concerned about it sitting long enough or being completely composted, you can leave it for a year, make sure that it's heated up and it's done all the things compost is supposed to do. But all in all mushroom compost is a pretty good ingredient. Now I like to incorporate my mushroom compost into my beds as I put in new plants but the other thing that I like to do once a year is I like to top dress with mushroom compost. Now I've just put in this penstemon so it's kind of dry and the nutrition value is really down in this soil here so I'm just going to take and put like a, maybe an inch layer of top dressing all around my bed, around all my plants and that will give it, that will hold moisture and that will give them a little boost of nutrition. And see how much better that looks too. So that's how you top dress with mushroom compost. Marci Degman has been a landscape designer and horticulture writer since 1997. What Does Mulch Look Like?